The Grammy Awards, considered very prestigious in the music industry, were held on February 12 in Los Angeles, USA. The “Song of the Year” award went to “Rolling In The Deep”, by Adele (from the United Kingdom). The “Album of the Year” award went to “21″, by Adele. The “Record of the Year” award went to “Rolling In The Deep”, by Adele again. Adele won a total of 6 awards. 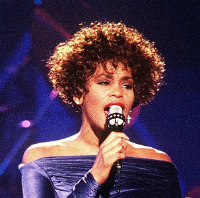 Whitney Houston (image), a famous American actress and singer, died the day before the Grammy Awards in the same city where the awards were held. Houston was remembered at the Grammys. “Grammy” is short for “gramophone”, and the trophy that is awarded is in the shape of a gramophone.